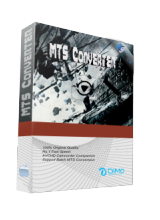 L'offre gratuite du jour pour Dimo MTS Converter 4.1.0 (Win & Mac) était valable le 13 mai 2018! La meilleure solution pour convertir/transcoder/éditer des clips MTS vers des formats standards tels que MP4, MOV, AVI, WMV, etc. Idéal pour l'édition ou la lecture n'importe où. Fournit des fonctionnalités d'édition vidéo riches comme le rognage, le recadrage, le réglage des effets, etc. Funny how the very first release of this program was 3.6.1 November 2017 not 1.0.0 makes the jump to version 4.1.0 from previous giveaway of 3.6.2 in December 2017 seem a bit less impressive. The Dimo product version number is unrelated to the particular program but instead it's the version of the parent Dimo Converter engine that every niche input format restricted program like this or the HD video converter or the MXF converter or 4K video converter uses. All are just cut down builds of the Dimo Video Converter Ultimate product restricting support to certain specific file types. They have unrealistic default bit rates for all output profiles meaning that if you dont know it and therefore do not manually override the default bit rate to something more sensible for any given profile you'll invariably end up with larger than needed video files from all of these Dimo converters. If you want to try any video converter product from Dimo wait till they do another giveaway of Dimo Video Converter Ultimate, it's been on here before .. in the mean time use something more capable like xmedia recode of format factory or handbrake then if and when Dimo offer their ultimate converter you'll have some experience of something more flexible to compare it with. Funny how the very first release of this program was 3.6.1 November 2017 not 1.0.0 makes the jump to version 4.1.0 from previous giveaway of 3.6.2 in December 2017 seem a bit less impressive. The Dimo product version number is unrelated to the particular program but instead it's the version of the parent Dimo Converter engine that every niche input format restricted program like this or the HD video converter or the MXF converter or 4K video converter uses. All are just cut down builds of the Dimo Video Converter Ultimate product restricting support to certain specific file types. They have unrealistic default bit rates for all output profiles meaning that if you dont know it and therefore do not manually override the default bit rate to something more sensible for any given profile you'll invariably end up with larger than needed video files from all of these Dimo converters. If you want to try any video converter product from Dimo wait till they do another giveaway of Dimo Video Converter Ultimate, it's been on here before .. in the mean time use something more capable like xmedia recode of format factory or handbrake then if and when Dimo offer their ultimate converter you'll have some experience of something more flexible to compare it with.